The presence of dust in the atmosphere is a serious problem which brings dangerous impacts on the environment and make drilling, recycling and demolition operations difficult to be carried out. 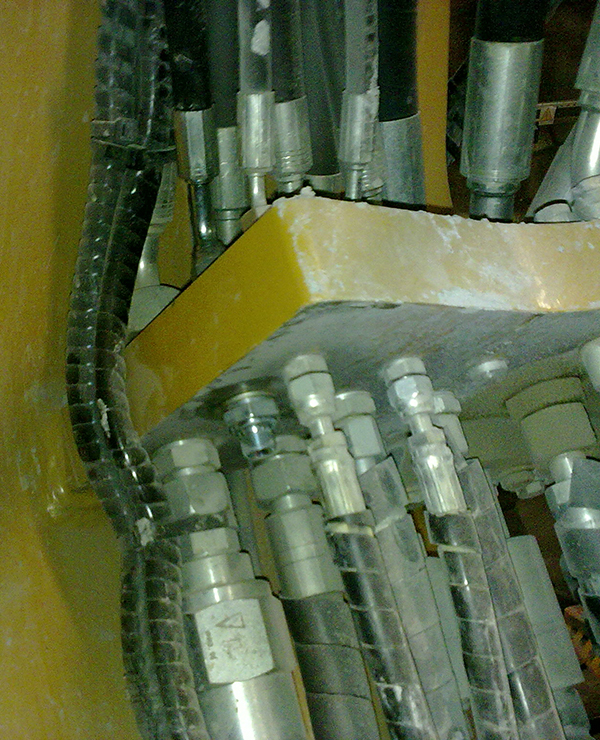 Based on the use of foams and considerable quantities of water injected directly in the perforation hole or on the material object of demolition, traditional dust reduction systems hardly solve the problem, other than causing reduced productivity (tunneling, recycling) and visibility or problems of water provisioning (high demolition). 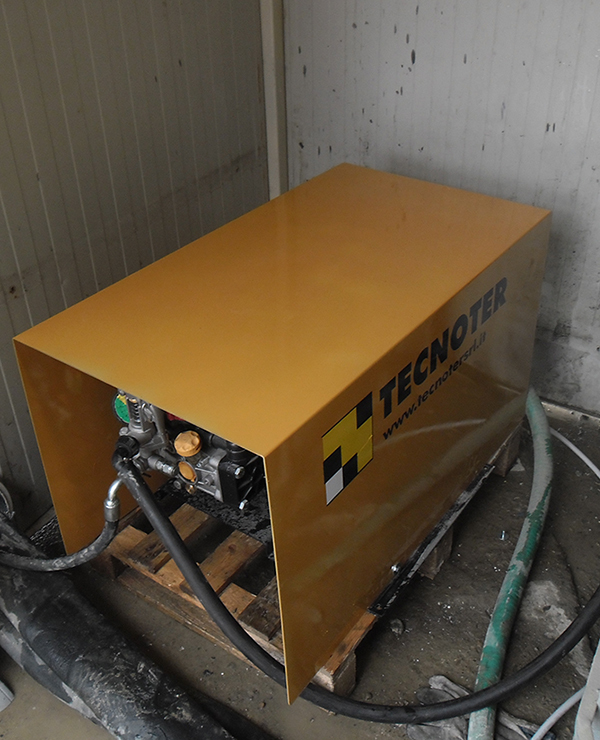 Tecnoter high pressure system is able to reduce dust considerably by using very low quantities of water. It consists in an electronically controlled, very high pressure water pump, which is able to spray a small quantity of water around the impact point of the demolition tool (hammer, crusher, etc.) by using water taken from a small tank located on the machine or directly from a connection to the water mains. All parts of the kit, including a small tank and a flexible line, are installed inside the excavator and are designed to be perfectly integrated with the existing auxiliary line. This kit drastically reduces dust and uses just a few liters of water (usually less than 15 liters per hour). This also means reducing the number of operators employed in a demolition and preserving the quality of the environment. 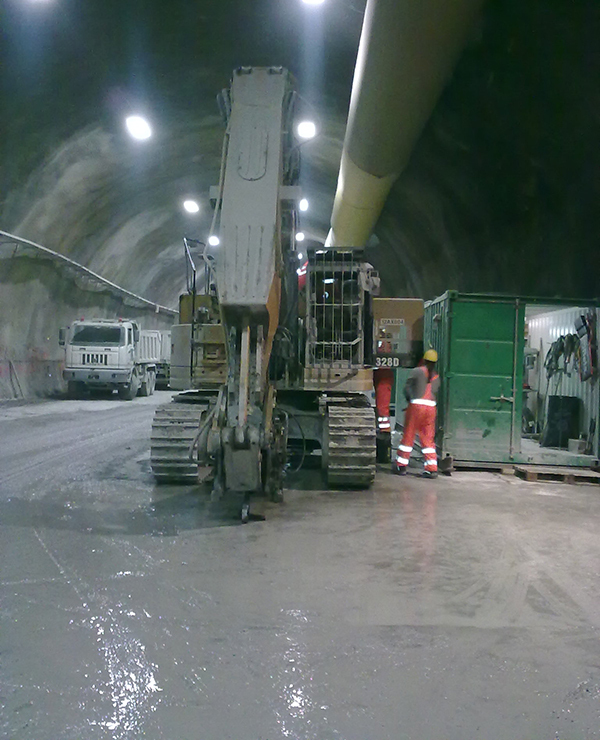 During drilling operations in tunnels, the presence of dust causes serious problems to operators' health and considerable reduction of productivity. Thanks to an advanced technology, that is able to constantly monitor the quantity of dust in the air (option), the Tecnoter dust reduction system allows a complete elimination of dust residue and does not hinder drilling operations in progress. A “mobile wall filter” is available for more economic use and effective dust reduction as well as for adapting to the material being drilled. 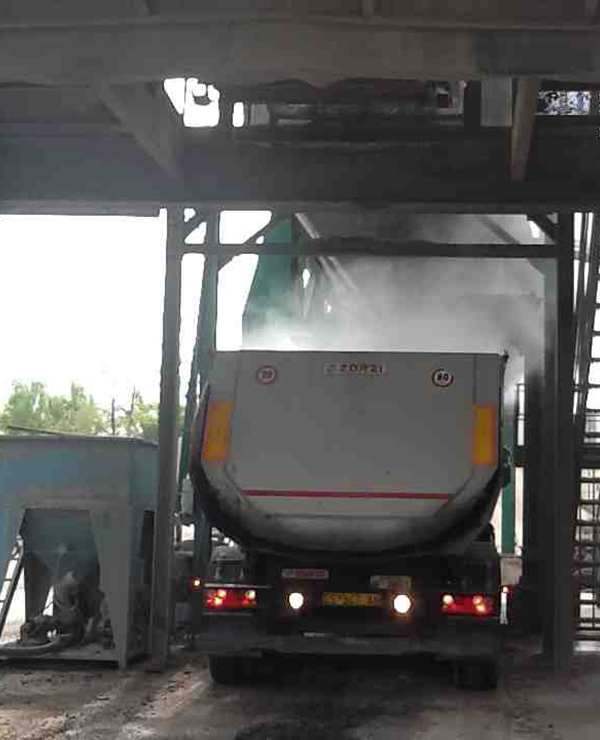 In addition to being expensive in terms of the number of workers needed, traditional dust reduction systems usually cause a considerable waste of water, making the construction site less livable and drastically reducing visibility during the operations. Tecnoter has designed an advanced system able to spray water directly on the demolition point when dust residue is created. Used in “smart spray” mode, this innovative system allows for a total reduction of residue assuring that little water is wasted (usually less than 300 litres per day), plus complete visibility, and a significant reduction in fixed costs. It also keeps construction sites clean. 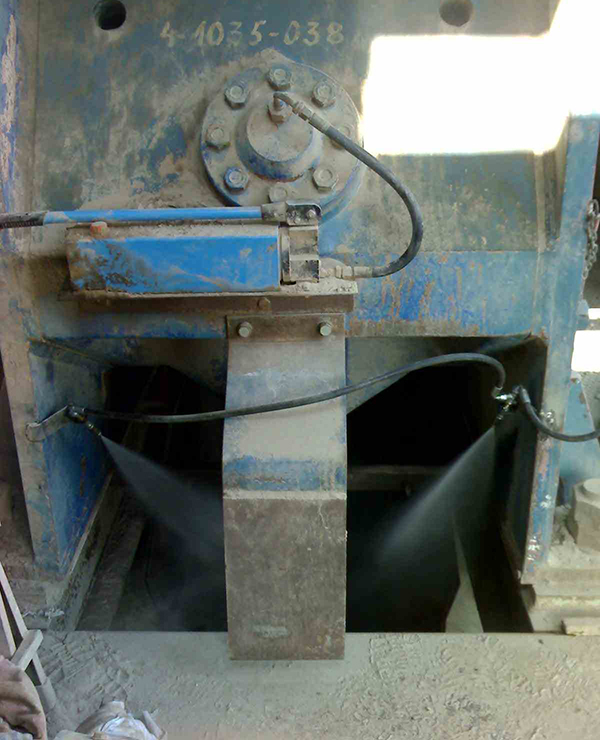 Tecnoter's dust reduction equipment, installed on a mobile crushing system, assures a total elimination of dust suspension, preserving productivity of operations and air quality. In addition, Tecnoter's advanced technology constantly monitors the work place (option) with a controlled spraying in the points where dust arises and an exceptionally low waste of water. The use of a 500-liter external tank and the “smart spray” mode, combined with the environmental monitoring system, allow crushers to operate independently for several days. 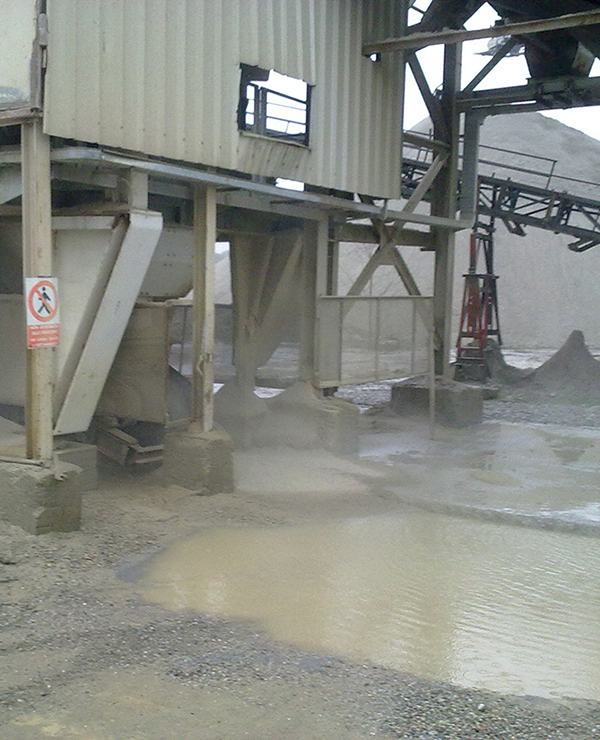 The integration of a suitable dust reduction system on a fixed crushing site has always been a big challenge. In comparison to the old drip systems and general fog cannons, the dust reduction system, based on a controlled spraying of water (even from an open air basin), allows for considerable dust reduction while leaving the humidity characteristics of the treated product unchanged. Tecnoter's dust reduction system for fixed locations can be integrated with environmental monitoring modules (option) in order to allow every single spraingy point to be started and adjusted automatically. The water consumption for each station ranges from 0.2 liters to about 4 liters per minute, depending on the external conditions and on the type of the crushed material.